CLAUDIO BRAVO’S WORRYING form in front of goal could be arrested with the help of a sports psychologist, former Manchester City goalkeeper Andy Dibble has said. 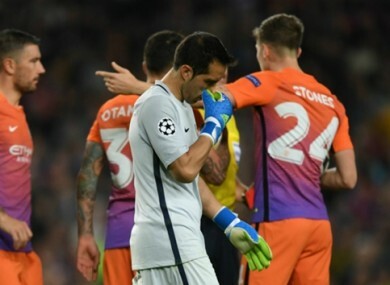 Bravo was signed by Pep Guardiola as a replacement for Joe Hart, who Guardiola felt would not suit his system of play, but the Chilean’s stats have made for grim reading since his arrival. And with the 33-year-old showing no signs of improvement, Dibble says that serious support is required to fix City’s problems between the sticks. “The pace of football in this country is so much faster than in La Liga,” the 51-year-old said. “He’s finding how sad and lonely our position can be — that is why he needs real help now. “Guardiola needs to have talks with him and the goalkeeping coach and create a plan of action. “He has to try and do all he can to help him and using a sports psychologist would be a good idea. Email “Bravo needs psychological help, says former Man City keeper”. Feedback on “Bravo needs psychological help, says former Man City keeper”.